By this time, everyone in the education world, or even the world next door, has heard about Betsy DeVos's appearance on 60 Minutes being grilled by Lesley Stahl. Unfortunately, most of this morning's coverage seems to focus on roasting her for being an uneducated twit. I recommend folks look a little more closely at what she's saying. Ready for just one more take on this? In the widely reposted exchange from the interview, DeVos is pressed on the results of her meddling in Michigan, where she got pretty much everything she wanted, and schools statewide have suffered because of it. DeVos tried to hold up Florida as an example of success. Neither state is an example of success by any conventional education measures. Michigan, which has had the most DeVosuian influence, is an educational disaster area. Florida just earned a low ranking in US K-12 education. People look at this disconnect and think, "Well, only a dope could think that these policies actually helped these states. Betsy DeVos must be a dope." I think the conclusion that she's a dope is a mistake. Here's another theory. Let's assume that getting a good education to every child is not a goal. Let's assume instead that the goal is to have education functioning on the free market, free of public institutions and government meddling. Let's assume that seeing some businesses prosper and profit is further proof that the market is working properly. Let's assume that directing public money to religious schools at the expense of government programs is a desirable and commendable outcome. In fact, let's assume that in such a system, having some schools and students sink to the bottom is a desirable outcome, because the free market is supposed to reward the deserving and allow the undeserving to sink to the low level where they belong. And if gutting public education has the effect of gutting unions and taking power away from those damn Godless Democrats, well, that's only right, too. If we assume those things, then Michigan and Florida are unqualified successes. So you can assume that DeVos calls these states a success because she's a dope, or you can listen to what she's telling you about her goals, which is that those states have come close to achieving them. The interview includes a clip of someone calling out her wealth, and there's the usual speaking against the idea of federal overreach (by which she seems to mean "reach") including the now-characteristic insistence that certain bad things shouldn't happen in school, but it's not the government's place to do anything about it. Nor is she ever going to really acknowledge systemic racism. The most charitable read for that last one is that she just doesn't get it; the least charitable read is that DeVos is simply racist herself (those black kids wouldn't get in so much trouble if they didn't deserve to, because you know how they are). And throughout the interview, there's that voice and that smile. That same rictus of a smirk. What is up with that? Any analysis of DeVos that doesn't factor in her religious views, her brand of Midwestern fundamentalism, is a mistake. Looking at that smile, I was reminded of an old Christian admonition- "Be in this world, but not of this world." It's a view that people of faith, people who have been elevated by a relationship with a personal Lord and Savior, do not actually belong in this dirty, debased world. 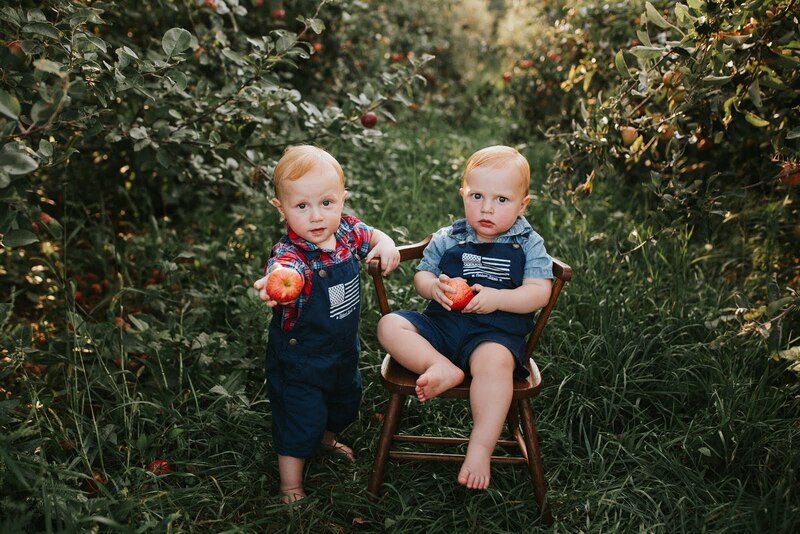 The rules of this world cannot be their rules. To achieve Godly goals, they may have to use worldy tools, even pretend to go along with worldly rules, but this is stooping to achieve a higher purpose. God will even give His chosen tools (like earthly wealth and political power), but they must avoid being seduced by worldly things, including a desire for worldly acclaim and recognition. That means, among other things, that the Chosen don't owe these earthly, debased, going-to-hell persons an explanation. You can be in the world with these people, and maybe feel sorry for them, but there is no need to connect with them-- you are almost like two separate species, passing each other for a brief moment as you travel to two separate destinations, you to eternal glory in Heaven, and they to endless damnation in Hell. So you smile. You smile hard, because it shows that you're still better than they are, and that you haven't stooped to their level. You smile even as they say mean things about you, because if the people of this world mount powerful forces against you, it's just further proof that you are right (and they are wrong). In fact, you are so right, and so sure of it, that real conversations with them aren't necessary because what could you learn from people who are so low and earthly and wrong? But you go through the motions to show that you're the bigger person, and because sometimes worldly tools must be used to achieve divine goals. You smile. Betsy DeVos's smile is the smile of Dolores Umbrage or the Church Lady. It's an angry, flinty smile, a smile that says, "I am in this world, but I am not of it, and some day I will rise above it and leave you behind." I know, I know. I am engaging in more armchair psychiatrist than people who just skip straight to, "She's a dope." But when I look at her, I see a face that I saw dozens of times on the United Methodist Youth Fellowship circuit. I always wondered how those folks would grow up, and in most cases life beat them into a humbler, kinder shape. Betsy DeVos looks to me like how they would have grown up if they had been bubbled inside enough wealth and privilege to convince them that they were right all along. 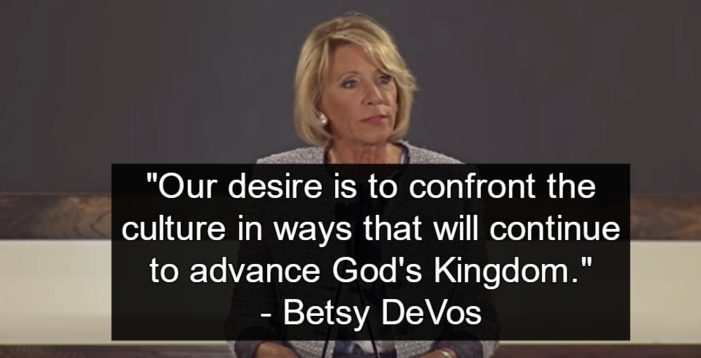 There's no humility there, and no kindness, though I would bet that DeVos thinks she has kind thoughts about the rest of us, and I suppose she does, in the same way that some folks have kind thoughts about scraggly stray cats. But not only is she not of this world, but she hasn't been in it all that often. I don't believe for a minute that DeVos is a dope. 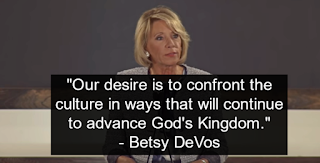 I think she's worked very hard at packaging her core beliefs, knowing that in this world you can't just say "Close all public schools, hand education over to religious schools, give everyone a voucher." You can't just say "There should be no collectives except the Church, and it should admit only those who deserve to be there." You can't just say, "Some people are supposed to be poor and miserable, because if you don't properly follow God's word, you're supposed to be poor and miserable." You can't just say, "My wealth is a sign from God that I have been anointed to do His work." You can't just say, "Your opposition to me just proves that Satan is mobilizing against me in this world." Your silence on all these matters is just a price of being in this world. But since you are not of this world, you won't have to pay that price forever. If DeVos sometimes seems confused by questions asked by worldly interviewers and worldly Congressmen, it is in part because they are following a worldly script that she rejected back in her youth. If she seems confused, it may not be because she doesn't get it, but because she still can't quite understand why the rest of us don't get it. Betsy DeVos is not a dope. I wish more people would see what she keeps putting right in front of our collective face. She has a vision of what education and government should look like, and if it seems that her vision is dangerous and damaging to the world, that does not matter to her, because this world is not her home. There we go, someone who gets it! Just because she's evil doesn't mean she's stupid. The latter is just a cover for the former. Dienne, thanks for pointing the way on Diane's blog to this entry! Peter thank you for this...you really helped me toward a greater understanding of this woman's (and those who share similar religious beliefs ) motivation and hubris. Yup. You got it. I have often thought that, as atrocious as she is, she's done progressive educators a solid. She's so glaringly wrong and annoying that people who haven't been paying attention to ed policy are suddenly watching in horrified fascination. Plus--being Secretary of Ed got her out of Michigan. "I think she's worked very hard at packaging her core beliefs, knowing that in this world you can't just say "Close all public schools, hand education over to religious schools, give everyone a voucher. . . "
Yes, the xtian fundie evangelical right has been practicing this deceit since the 70s. They proudly speak about how to do such deceit-"Ya know it's what my god would want"
Excellent summary Peter! 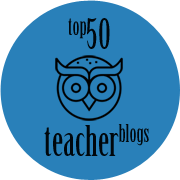 Thanks, will be sharing this cogent article! BINGO! She knows exactly what she is doing. Her smile is so devious and mean. If that is how she thinks her faith is supposed to play out in public service, then I, as a person of deep faith, have to disagree with her. I believe in public education and I have conservative values that are fueled by my faith. However, not once do they lead me to believe that I am too good to listen to other people and consider other perspectives. I can't disagree with your assessment of her motivations. However, I feel compelled to let you know that there are people of the Christian faith who feel very different about public education and hope that no one reading this would lump us all into the same trash pile. Indeed what you say is true. I wish there were more examples of your perspective in my environment--perhaps I would not have such a hard time wrestling my internalized stereotypes. I try, I do, but my patience is tested mightily. Singer-songwriter Cheryl Wheeler asked, "Mercy, what ever happened to the God of Love?". Unfortunatey, she misses the great commission of the Bible which is to go out into the world interact with all people and genuinely share the Gospel and disciple others. Be part of the world, but be an example of Christ’s love and forgiveness and share.. It is not an “ I am amongst the chosen, and you are not”, type of mentality. She is missing the point. Her ilk don't even believe in the authority of the Constitution. I think she's nothing more than a charlatan, just another snake-oil salesperson. A huckster looking to get her slice of the $600 million dollar public education pie. That smile is as fake as education credentials and I really don't think her true beliefs go much deeper than her bank accounts. Does social capital count? Her family and culture will enjoy the benefits, long after they do her funeral eulogy. I can't claim to know her motivations. But, not all Christians think this way. I don't. Thank you, Peter. I first became aware of how totally out of place that pasted on smirk was when she was unable to wipe it from her face while listening to Sam Zeif recount his experience at Parkland. A most repugnant exhibition of inability to even fake empathy. to be snarky......she was comforted by the fact that 17 people were going to live in eternity with God. I'm amazed that there is not more resistance to this. Where is the respect for the constitutional separation of church and state? Insightful. Calvinism for the 21st century...the Protestant Ethic and the Spirit of Capitalism..this time as farce. Yes she thinks she’s on a roll! I never understood why Calvinists bothered making their surroundings into their own image. Since everyone is predestined in the calvinists' mind, everyone will go to the devil regardless of the window dressing the calvinists put up.